Many of the Aprilia Vee twins have an extra weight fitted to the back of the flywheel generator and it’s common practice among those who race or tune RSVRs to remove it, making the bike rev slightly quicker. And as the RST also has this 2.5lbs (just over a kilo) of extra weight fitted as standard, you can also do it to your Futura. Since this mod comes from the track, where every little change counts, it’s debateable whether you’ll feel much diference on the street, but those Futura owners who have done it seem to like it so I’ve included it on the site. RSVR owner Uberchicken did this mod to his own bike and documented it for us all to follow. The procedure for a Futura is essentially the same. You can download it here: Uberchicken’s flywheel mod. It has to be said that you should have a reasonable level of mechanical skill to do this one – and some special tools, such as a flywheel puller. 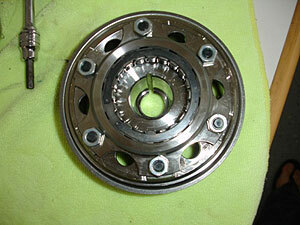 You’ll also need to heat up the flywheel to get it off – a delicate job.